Magnolia stellata is commonly called ‘star magnolia’, referring to the shape of its white flowers. 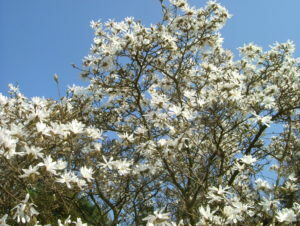 These pure white flowers look stunning against a clear blue sky on a bright spring day. Unfortunately, its blooms are easily damaged by late frosts and will quickly turn brown as a result. For that reason, when Magnolias begin to open at the gardens, the whole gardening team keep their fingers crossed that we don’t have any cold nights that could damage their wonderful blooms. In the Rock Garden we have a number of different Magnolias planted together – a real spectacle when they are all in flower. This particular species of Magnolia originates from Japan and forms a compact bushy tree or large shrub. Magnolias are part of the Magnoliaceae family, which are a very primitive angiosperm structure (flowering plant) that has similarities with known fossil records.